TurboTax vs. H&R Block 2019: Which is the best tax software? There is much to be pleased about in Intuit’s QuickBooks 2010 and, unfortunately, still quite a bit to be disappointed with, as well. While Intuit has made an effort to make QuickBooks easier to learn and use and have finally added the option to receive credit card payments from within the application, the program is still missing key features, and the Home Page interface introduced last year remains more of a patina than an indication of in-depth change. 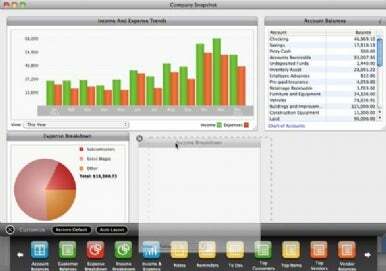 QuickBooks 2010 has been improved in several ways that make managing your business and income easier. This is especially true for users new to QuickBooks. Intuit has streamlined the setup process so that it takes less time to create a new company file. While older versions had an elaborate setup process that took up to 15 minutes to complete, using QuickBooks 2010 I had a new company file set up in less than two minutes. There’s also a new Guide Me feature (an on/off switch in the upper right hand corner of the Home Page) that highlights and helps you learn how to use QuickBooks’ most important features. While helpful, Guide Me is only likely to be of benefit to novice users. What’s likely to be a huge benefit for many users is the addition of merchant services, which means that you’ll finally be able to accept credit card payments from within QuickBooks. This for-fee service ($20 per month, $60 setup) is now integrated into QuickBooks and allows you to accept and securely store client credit card information. Also, you can now send e-mail invoices to your customers and provide more personalized messages when you send out bulk e-mail. Snapshot is a new customizable reporting tool that gives you an overview of your company’s financial health. QuickBooks includes a new free application called My Time that lets you track time and then push the data recorded in My Time to to specific clients and jobs in QuickBooks. My Time works well but, unfortunately, there’s no iPhone or iPod Touch version of the application, which is something you’ll find as a basic feature of online accounting tools like Ballpark ( ) and The Invoice Machine ( ). 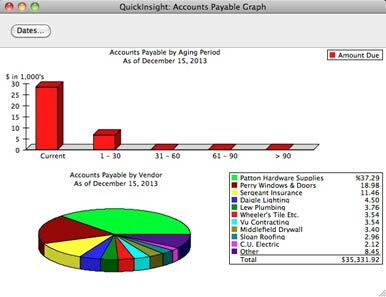 Finally, among QuickBooks’ useful new features is a customizable Snapshot view of your business. Using the Snapshot you can add or remove widgets, such as account balances, income and expense trends, and expense breakdowns, so that you have the best possible view of the health of your business. While QuickBooks’ Home Page is still shiny and new, the program’s graphs, data entry fields, and reports remain decidedly retro. Those of you who have been down the QuickBooks review trail with me before may recall the short list of missing features offered at the beginning of my QuickBooks 2009 ( ) review. While credit card processing has finally been crossed off of that list, multi-user capabilities, cross platform data files, and online bill pay have not. As was reported in a news story about the release of QuickBooks 2010, Intuit states that they, “Are aware of it, and want to address it.” That sounds like good news, but it doesn’t explain why these features haven’t been added to QuickBooks or whether they’ll be offered in future versions. Furthermore, Intuit has done nothing to address the 1999-era graphs, reports, and data entry forms, which lie a click away, just beneath the surface of QuickBooks’ otherwise beautiful and functional interface. QuickBooks 2010 offers several new features that are sure to make it a hit with both new and upgrading users. A quicker setup process, credit card processing, Guide Me, My Time, and the Company Snapshot are all features that make QuickBooks a compelling business tool. But, unfortunately, it’s still missing some seemingly basic features, like multi-user capabilities, online bill pay, and cross-platform data files, without which QuickBooks is just a good rather than a great business accounting application.